Flash! On October 9, the Earth was visited by an interplanetary spacecraft! No, this is not a scene from "The Day the Earth Stood Still" or "War of the Worlds," but a flyby maneuver by NASA's latest Jupiter probe, Juno. Juno was launched on August 5, 2011 on an Atlas 551 rocket into the first leg of its journey to Jupiter. This looping trajectory took it as far as the Asteroid Belt just beyond the orbit of Mars, and then back toward the Earth again. The Earth flyby on October 9 was a "gravitational assist" or "slingshot" maneuver. It imparted a small amount of Earth's momentum to Juno, boosting its velocity to put it on a final course to Jupiter. When it arrives there in 2016, Juno will become only the second spacecraft to orbit Jupiter, and the first to fly over Jupiter's polar regions, providing us with a breathtaking view that we haven't seen before. 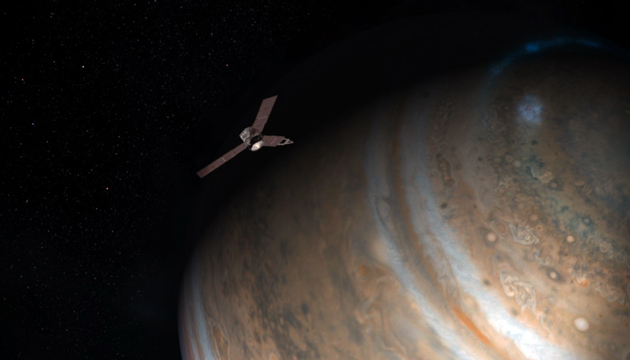 The first probe to orbit Jupiter, back in 1995, was the Galileo spacecraft, named in honor of Galileo Galilei, who first studied Jupiter with a telescope. Juno bears its own homage to Galileo: a plaque imprinted with the man's self-portrait and a hand-written passage he made on his observation of Jupiter. Juno's overarching purpose is to give us a better understanding of Jupiter's origins and its evolution over time by probing beneath its cloud tops and discovering properties and processes held secret in Jupiter's interior. And what we learn will tell us more than just Jupiter's inner workings, but of the early conditions in the formation of our solar system itself, and how Jupiter's influence may have shaped it. Analogous to how we study residual evidence in the growth rings of trees, mud cores from the ocean floor, and ice cores from Antarctica and Greenland to map out Earth's geologic and climate history, evidence of the solar system's formation, growth and changes over time are locked up in the bodies of planets, asteroids, and comets -- just waiting for us to dig in and decode it. A greater understanding of Jupiter, inside and out, today and over time, will also give us insight into the nature of gas giant extrasolar planets that we have been detecting over the past two decades. Juno will probe deep into Jupiter's atmosphere, giving us detailed information about its composition, temperature, motion, circulation and other factors. By measuring the amounts of chemicals like water and ammonia in Jupiter's deep atmosphere, Juno will help us narrow down which of several competing theories of planet formation hold water, or if none of them do -- in which case theorists will need to go back to the drawing board. Juno will measure and map out Jupiter's gravitational and magnetic fields, the sources of which are found deep within the planet. Just as a geologist (yes, here's another analogy) can infer what goes on deep within the Earth by studying the emanations of a volcano, Jupiter's gravity and magnetism can provide information about the deep internal structures of that world. In particular, the long-standing question of whether Jupiter has a solid rocky core -- and if so, how big it is -- may get some answers from Juno. By observing the powerful magnetic field which emerges at the planet's poles and observing the polar auroras (Northern and Southern lights), we hope to learn how Jupiter's magnetism affects its complex and abundant atmosphere. Juno will orbit Jupiter 32 times over the course of a year, making passes over Jupiter's surface as close as 3000 miles (extremely close relative to Jupiter's 88,000 mile diameter) and giving us an extremely close up and stunning view. At the end of its mission in October 2017, Juno will be deliberately "deorbited" and burn up in Jupiter's atmosphere, the very thing it will study. The Galileo spacecraft was similarly deorbited at the end of its mission to prevent the eventuality of it crashing into one of Jupiter's moons, which for all we know may harbor some form of life. Far from a heartless suicide order, the deorbiting of expiring spacecraft is an effort on our part to clean up our trash. In Roman mythology, Jupiter, king of the gods, veiled his mischievous exploits by drawing a shroud of clouds around himself. It was Jupiter's wife, the goddess Juno, who was able to peer through the clouds and reveal Jupiter's true nature. We can look forward to what marvelous mischief the Juno spacecraft will reveal about the king of planets.